From insects to spiders – members of the public are being invited to come into the countryside and learn about the wonderful world of bugs. 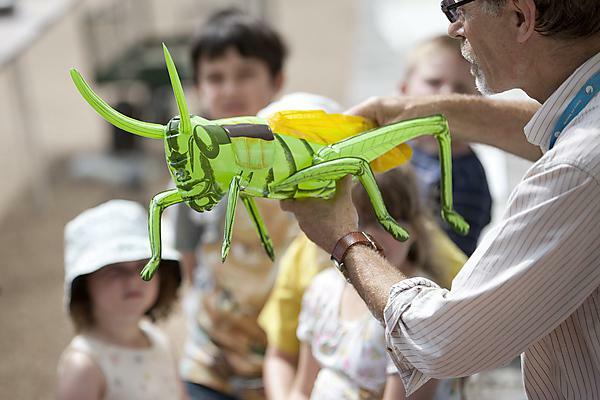 The packed programme of events is part of National Insect Week, a bi-annual event organised by the Royal Entomological Society, supported by partners including Open Air Laboratories, and led in the South West by the University. It starts on Monday 23 June with a grand launch at the Natural History Museum in London. As a primer to this week, a spider hunt has been organised by the Wild About Plymouth team, which is a joint venture run by the University and Plymouth City Museum. This starts at 11am on 21 June in Devonport Park and will be led by the unit’s own spider expert Peter Smithers. Local events continue on Saturday 28 with an insect safari and art workshop with Jennie Hale, a well-known wildlife artist and potter. She will be leading the artists on a day of discovery at Abbyford wood Okehampton, while Peter Smithers will be part of the science team ready to introduce everyone to the local insects. The University has also joined forces with Buglife to run an insect safari come bioblitz at Bolberry Down, near Hope Cove on Sunday 29 June. Peter added: “The world of insects is a truly fascinating one, insects range from the beautiful and bizarre to the downright beastly. These events offer local families and bug hunters, young and old, an opportunity to come out and be amazed by the insect world on their doorsteps." The University’s entomology team will also be visiting schools in the Plymouth area to run a series of insect related activities. Further afield on 27 June, Peter Smithers is part of a team that will lead a bug hunt for 50 local children in the gardens of Highgrove House, and HRH Prince Charles has agreed to drop by and lend a hand to encourage the next generation to take a keen interest in the natural world.